Suzuki India has launched the 2019 Hayabusa for Rs 13.74 lakh (ex-showroom Delhi), which is a small hike of Rs 17,000 over the outgoing model. The Busa gets two new colour schemes - Metallic Oort Gray and Glass Sparkle Black. It was one of the most powerful and fastest production motorcycles of its time and is still considered amongst the best drag motorcycles. Mechanically, the 2019 Suzuki Hayabusa is powered by the 1,340cc inline-four engine that produces 195PS of power at 9,500rpm and a peak torque of 155Nm at 7,200rpm. 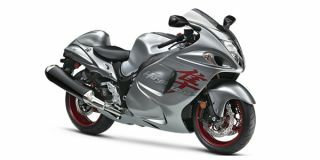 Suzuki Hayabusa prices start at Rs. 13.74 lakh (Ex-Showroom). Suzuki Hayabusa is available in 1 variants and 2 colours. Share your experiences with Hayabusa? The claimed ARAI mileage for the Suzuki Hayabusa petrol is 17 kmpl. The world's fastest production motorcycle is also one of the easiest to ride. Q. I am 162 cm in height, is it comfortable for me? Its comfortable for 5.4" to 5.6" Short rider? Q. How many times in a year servicing of Hayabusa to be done? We would suggest you check the bike's user manual as it contains all the information regarding the proper servicing of the bike. Q. How big can be the rear tire or how big can we use? Q. Which one is better Suzuki Hayabusa or Kawasaki Ninja ZX 14R? World's fastest production motorcycle, the Suzuki Hayabusa. Need we say more? If You Thought The Kawasaki H2R Was Fast, Think Again! Is Suzuki Working On A New Hayabusa? Hayabusa has all the qualities to gives a perfect performance. Ahh seriously a crazy bike own it to know it the reaction u get on road it will satisfy you .